Laptop Lunches Bento Ware sent me one Bento Lunch Box to review. My daughter was very happy to have it because she loves vegetable salad and whenever she have a cold lunch, that's what she asks me to prepare. I received it last Saturday and since she did not order a hot lunch for Monday, we used it to pack her lunch. I always wanted to have a bento lunch box because it is fun to prepare my children's lunches. I had two lunch boxes before but Laptop Lunches Bento is by far the best there is. It contains four individual containers and a compartment for spoon, fork, or chopsticks. My daughter got complimented of how her lunch box is very unique and how good looking her food was. One of the teachers asked m me where I bought it so I referred them to the website. 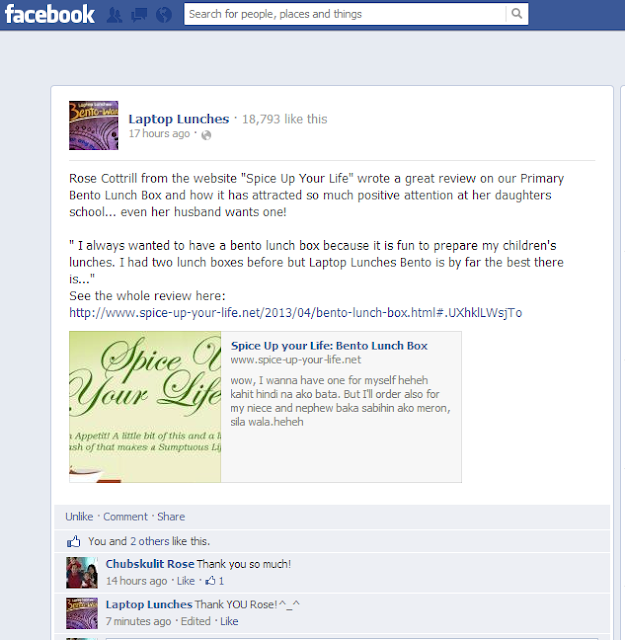 I also suggested to check out Laptop Lunches Bento Ware in Twitter and Facebook. I am thinking of buying two more of this because my husband want one and so does our son. Thanks once again Laptop Lunches Bento-Ware. Thank you Laptop Lunches Bento for sharing my article to your FB Page and Twitter. Greatly appreciate it. Disclaimer: Products mentioned above is received for FREE in return of my honest opinion in the form of review. NO monetary compensation was involved in facilitating this review. How neat is that thank you for sharing my daughter needs a new one. This looks like it would be great to pack a lunch to bring to the office as well! That is the coolest lunch box i have ever seen! I have been looking for a lunch box for munchkin, and this is perfect! This is an Awesome lunch box! lots of compartments but nice and compact, I like it! What a unique product I bet she loves her lunch box it is really colorful. Should be good to have one box for my pre-schooler so she can bring a variety of her favorite munchies to school. I saw these at Whole Foods the other day and picked up a couple. I love them, they have a container for everything. Cool! I liked the fun and bright colors, perfect for my kindergartner. I like it too sis. I'm thinking to buy one for hubby too. Am sure your daughter is in seventh heaven when you handed her lunch box. that looks very neat, so good for your daughter to have very healthy taste, veggies. Gotta check the site. This is so cute for my apo. i "like" this photo when you shared it to your muzy account. i like how the lunch box can be organized to fill an assortment of foods for the kids to take to school. my little girl would be envious. we're gonna have to buy her a lunch box soon because her schedule in 4th grade class would require her to stay in school all day long. this is an awesome lunch box... the food are organized.. and well not messy..
your daughter lunch look so yummy and healthy. that bento lunch box is really cool, it keeps everything from mixing together. This bento lunch box is really great for the kids, now that its almost school time. Oh that's neat. My little girl will like it too. How cool! Getting free items as beautiful as that would make you flaunt the stuff to everyone. Hehe! This is an awesome lunchbox.